Last night on the Facebook life event we talked about erasing your digital footprint. The good thing is that it is possible to get a lot of your info off line. The bad thing is that you can’t completely erase it and still use the internet at the same time. Also, it takes a long time to erase your digital footprint. Thanks to Michael Chesbro, the author of the document I was using as a reference last night, and some other resources I’ve complied I’ll be sharing some information to help you get started. First, we will talk about the people finders and online directories. These are horrifying. Not only is your information on there, but my relatives’ addresses, phone numbers, people who are associated with me. It’s all there and when you couple that information with what is public record through your county assessor’s office, it makes it easy to find you in real life; which is exactly what we do NOT want. So here are a list of online directories and people finders and how you can opt out of these and take your name off of them. As I said above, it takes time. It took me 3 hours to do 4 of them. Note to ladies, if you’re married you have to search your maiden name also. I had to use a separate email for my married name and maiden name. They didn’t like my using the same one. Many of these lists come from “harmless” telemarketers who buy and sell lists and as it goes more information is added to your profile and it becomes what it is today with all of your information out there. Even home phone numbers, home address, and who you’re related too. So, each time the list is bought or sold it gathers more information as it goes and you’re significantly MORE vulnerable than you ever knew, or thought was possible. 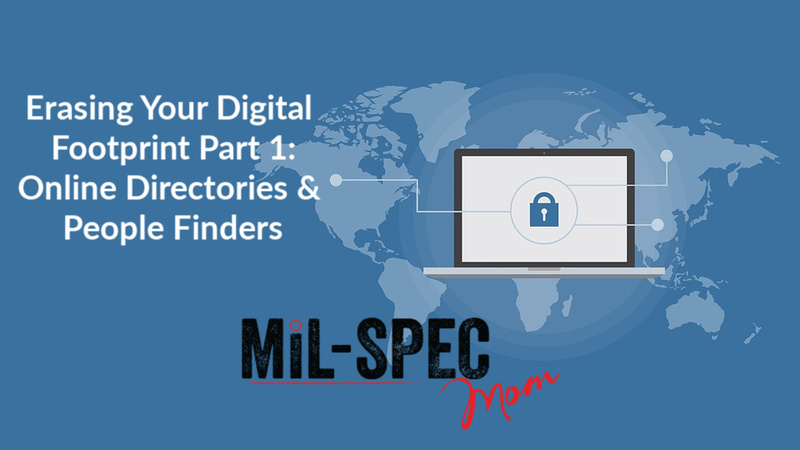 So for the first phase of OPSEC and PERSEC is getting your personal information off the online directories and people finders. Below is a list of the most common people finders and directories that are out there. Lookup.com– Search for your listing on LookUp.com. You can identify a listing by the blue and black circle icon to the left of the listing. Note that other search sites’ information is aggregated below, but it doesn’t count as a LookUp profile. Next, open their opt-out page. Fill in first name, last name, the URL of the LookUp profile you found for yourself, email, phone, and address to complete the opt-out request. We recommend using a masked email to protect your personal email but still receive confirmation emails. LookUpAnyone.com- Please note that LookUpAnyone is owned by Intelius, which owns or is affiliated with the following other people search websites: Zabasearch, Spock, iSearch, PublicRecords, PeopleLookUp, PhonesBook, and DateCheck. When you request removal of your records, you should also request removal from all of Intelius’s network of sites. You can opt-out of Intelius either online or through a fax. Their online opt-out page is here. You can also fax your ID and a letter containing the information you want removed to 425-974-6194. MyLife.com-Call MyLife at (888) 704-1900 and press 2 to speak to an operator. Have the following information on hand: name, age, date of birth, email, current address, and one previous address. Tell them that you want your listing removed and provide the information that they ask for. Once they confirm removal, the listing will be off the site in 7-10 days. PeopleLookup.com, PhoneBook.com, PublicRecords.com, –Please note that All these sites are owned by Intelius, which owns or is affiliated with the following other people search websites: Zabasearch, Spock, iSearch, publicRecords, PhonesBook, DateCheck, and LookupAnyone. When you request removal of your records, you should also request removal from all of Intelius’s network of sites. Thank you for your help with this personal security issue. PrivateEye.com, Public-Records-Now.com, –Note that PrivateEye, USA-People-Search, Veromi, PeopleFinders, and PublicRecordsNow are all owned by the same parent company, Confi-Chek.com. Sending 1 opt-out and referencing all 4 companies should remove you from all of them. (4) a letter requesting removal. Spoke.com- Search for yourself on Spoke and click the ‘This is me’ button. On the next page, look for the ‘To suppress your profile, click here’ link on the right side of the page and follow the directions. Be sure to click the removal link in the email you provide to complete the process. Wink.com-Wink is owned and operated by MyLife, so the same opt-out instructions apply. Call MyLife at (888) 704-1900 and press 2 to speak to an operator. Have the following information on hand: name, age, date of birth, email, current address, and one previous address. Tell them that you want your listing removed and provide the information that they ask for. Be sure to specifically mention that you want to be removed from Wink.com as well as from MyLife.com. Once they confirm removal, the listing will be off the site in 7-10 days. Like I said, this is going to take a while! I would print this post off and highlight the sites as you go through and get your information off. OR get the DeleteMe program for $99 and have them do it for you!